The Congleton Chronicle which two days ago became the first (local) newspaper in the world to be published in its entirety and for sale as an app through Apple’s iPhone platform, also marks an important break in the way local and regional newspapers will be used as mobile resources. The 25 February issue of the The Congleton Chronicle contains over 500 phone numbers which are clickable to call from the page. In fact there are 525 clickable phone numbers in that issue of the Chronicle and that averages roughly 9 phone numbers a page. Local newspapers are full of phone numbers that are direct-response buttons for businesses and organisations that advertise in the paper. All live links in Exact Editions apps on the iPhone platform have a green highlight. There are also in this recent issue of the Chronicle, 147 web links, 72 email links and 63 postcode links. This represents potential interactivity in the digital newspaper, a great deal of navigational assistance to the reader. The local newspaper which has all its links enabled, becomes much more useful to its reader (and for this reason also more valuable to the publisher and the advertiser). Of course the issue can also be searched….. The local paper on a mobile platform thus becomes not merely a resource that can be carried in pocket or handbag to be read when convenient. The local paper becomes in its mobile embodiment the users’ instant and easiest reference centre (via advertisers’ phone numbers and weblinks). Exact Editions is the only platform that consistently supports direct phone calls from the pages of digital magazines and newspapers. Surprisingly few web services enable this direct interactivity. They are missing a trick. This is a matter of considerable potential for advertisers, especially as more web access is from mobile platforms…..Craigslist phone numbers are generally not clickable to call. Even Google Maps listings do not usually turn the phone number, which is often given, into a live link. Newspapers and magazines should push for a tight integration with the phone, as a way of reclaiming some advertising reach and power. The iPhone has given them this opportunity and the Exact Editions database can power the connections. 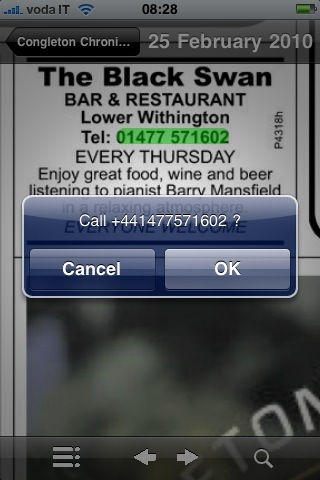 PS Barry Mansfield is playing at the Black Swan tonight. I just checked, by phone. I recommend the beer also. Great ideas also for any travel guides publisher!